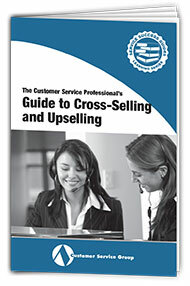 Cross-selling and upselling can be valuable business tools, yet many customer service professionals are reluctant to add these skills to their repertoire because of the “stigma” associated with selling. 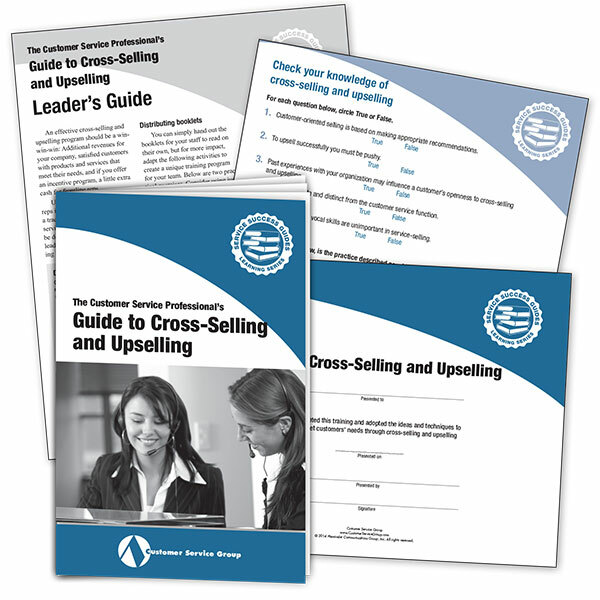 Now you can help your reps develop the skills they need to incorporate selling into their daily work with Guide to Cross-Selling and Upselling. The first step in accepting a sales role is understanding that cross-selling and upselling are elements of proactive customer service. Think of it this way: When you come across a really great product or service, don’t you pass the information along to friends? Similarly, if your company offers products that your customers might find useful, telling them is a proactive effort on your part to increase their satisfaction and loyalty. The reality is that customers may not be aware of the wide array of products your company offers. And more often than not, they’ll be thankful for your professional advice. There are many different approaches to sales — and some are definitely pushy. But as a customer service rep, you will use techniques that focus on identifying customer needs, laying out options, and creating an environment that gives the customer room to make his or her own buying decisions. With this approach, you’ll find that selling can be integrated into customer service in a number of ways without damaging the customer relationship. 1. Describe your goals for the role play, i.e., to help reps learn to identify buying signals and cross-sell and upsell opportunities. 2. Assign roles. Typically one person will be the customer and one person will be the customer service rep.
3. Begin the role play. 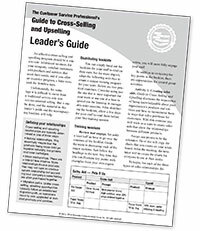 Hand out sheets with the “customer” portion of the dialog from your Leader’s Guide. 4. Debrief. At the end of each role-play, the observer facilitates the debrief, asking the “reps” and the “customers” what went well, and what could change the next time. Ask the “customer” for one specific suggestion for improvement. 5. Switch roles. Next, have “reps” and “customers” switch roles and tackle the next sales situation. 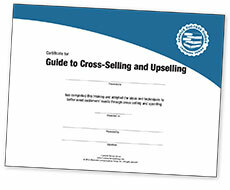 Guide to Cross-Selling and Upselling is guaranteed. We want you and your reps to use this valuable resource and put its ideas to work in your department. 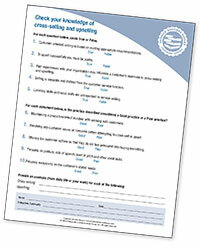 Then, if you are not 100% satisfied, you may return your materials within 30 days for a full refund.